SAN RAMON, CA--(Marketwire - February 1, 2010) - Accela, Inc., the leading provider of Web-based and mobile software that makes government services available 24/7, today announced the availability of a new solution, Accela Mobile Office™, which Accela CEO and President Maury Blackman described as poised to "revolutionize" how field-based government teams do their jobs and deliver services to the public. By giving mobile government workers the information used by back-office staff, in a simple and flexible user interface, Accela Mobile Office paves the way for traditional government counter services to be brought directly into the community -- improving turnaround time and increasing citizen satisfaction. "Citizens around the world have cut the cord and gotten used to obtaining information and services wherever and whenever they want them," said Maury Blackman, President and CEO of Accela. "Without question, these same expectations will increasingly apply to government services. Accela's approach is to continually anticipate these trends, and deliver solutions that meet the needs of government now and into the future." Accela Mobile Office extends the capabilities of the Accela Automation® 7.0 enterprise application, also announced today (see related news release), for inspections, code enforcement, work orders, service requests, and more. Accela Mobile Office has been developed with the detailed needs of mobile workers firmly in mind. The new product features bold, touch-screen capability and a high-contrast user interface, built using the Microsoft Windows Presentation Foundation (WPF) for ease of use in challenging outdoor environments. Navigation is designed to be simple, with one-click access to all areas of the application from the home screen. Drop-down menus, standardized comments, and checklists make data collection easier, while on-demand reporting enables workers to print and leave important documents, like correction notices or stop-work orders. GIS mapping is infused throughout the user experience, permitting users to access an agency's entire map roster at their jobsite or wherever they are, or to combine them with Microsoft Bing Maps to create powerful mashups of all geographic data. This capability allows users to overlay needed maps -- such as a map showing water pump locations, with another showing a community's fire hydrants, and still another depicting neighborhoods in a flood plain -- for a complete view of items impacting their inspections or other work in the field. Routing support from ESRI's ArcGIS® Server is also built into the product, empowering users to plot out the best routes for their daily job list in order to save time and fuel. 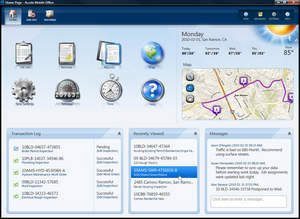 Since the product's map control tools have been built using the Microsoft Silverlight 3 web application framework, users enjoy a consistent map-centric experience in the office or field. Accela Mobile Office gives government agencies the ability to configure the application based on user roles and on specific IT requirements. While inspectors may want to start with a geographic view of where their jobs are for the day, a maintenance worker may be more interested in viewing detailed asset information for a single job. Store and forward capability benefits agencies that have limited or no connectivity in the field, ensuring that needed data is always accessible and updated records are synchronized later. Accela Mobile Office is available now for users of Accela Automation 7.0, and is compatible with devices running Microsoft Windows 7, Vista or XP operating systems. Additional information on procurement and pricing options is available at: www.accela.com or info@accela.com. Accela and Accela Automation are registered trademarks of Accela, Inc. Accela Mobile Office is a trademark of Accela, Inc.
New Accela Mobile Office(TM) extends the processing capabilities of Accela Automation(R) 7.0 software to the field, providing the same data and tools as back-office workers, including real-time access to maps, work assignments, and historical data. The product offers an easy-to-use, touch-enabled interface for field staff to manage their daily tasks and bring counter services to the community.